Announced earlier this year, “Mobilegeddon” is an update to Google’s search algorithm that will use your website’s mobile-friendliness as a ranking signal. 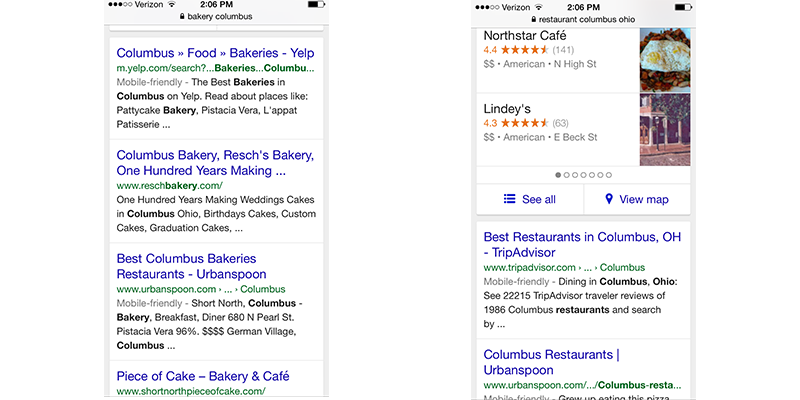 For the first time, Google is rewarding mobile-friendly websites in search results. Google has warned your webmaster if your website is not mobile-friendly. It has been sending massive amounts of emails with the subject line, “fix mobile usability issues found on…” If you haven’t heard anything directly from your webmaster, we recommend you reach out them. This is the biggest Google algorithm update since Panda and Penguin. 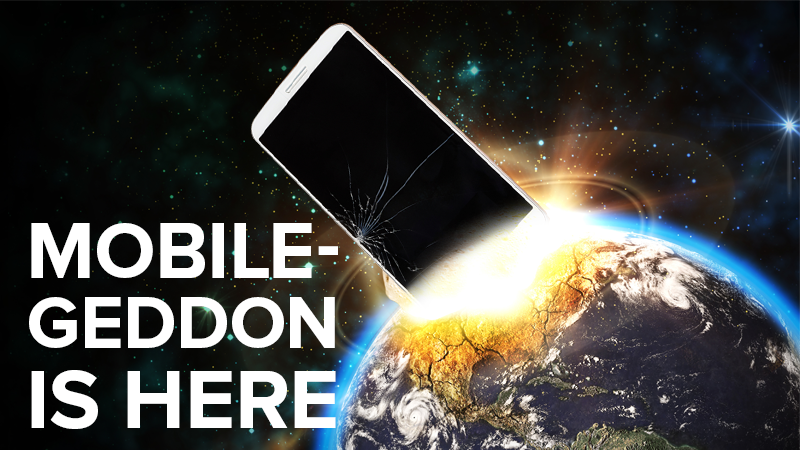 “Mobilegeddon” is a game changer. Google is now placing "mobile-friendly labels in front of websites in search results. Having a mobile-friendly website is important for user experience. More and more consumers are using mobile devices to search. While Google is interested in bettering user experience, it’s also interested in the usefulness of its product. If a user is searching on a mobile device, it’s in Google’s best interest to return search results that are optimized for the user’s device. It creates a better browsing experience and increases a user’s loyalty to Google. Consumers live on their smartphones. Consumers search on mobile devices because they want access to information quickly and easily. Looking for a place to eat with your friends? Need directions? Need a quick oil change? Consumer want results fast. Why would Google or your consumers want search results that slow the information gathering process down? Are we telling you this to sell you a website? No. Are we saying you need have a mobile-friendly website? Yes. It really is that simple. Mobilize your website and you will take advantage of this algorithm change. Google is not trying to stick it to businesses or fill the money coffers of web design firms. As the world leader among search engines – 68 to 70 percent of all searches are done on Google – this is simply a sign of the times. Our phones have more functionality in them than ever before, and the latest updates seem to pop up once every three to six months: bigger screens, curved screens, better camera resolution and so forth. Regardless of the phone, the one thing that will get your business on all of these screens is having a mobile-friendly website. Two words: Responsive design. It's a website designed to function on any screen, regardless of the dimension. Why is responsive design important? Because there are 232 possible screen sizes out there. This includes desktop computers, laptops, tablets and smartphones. In order to accommodate screens with smaller dimensions, your website needs to have the kind of functionality that allows users to navigate smoothly and efficiently. 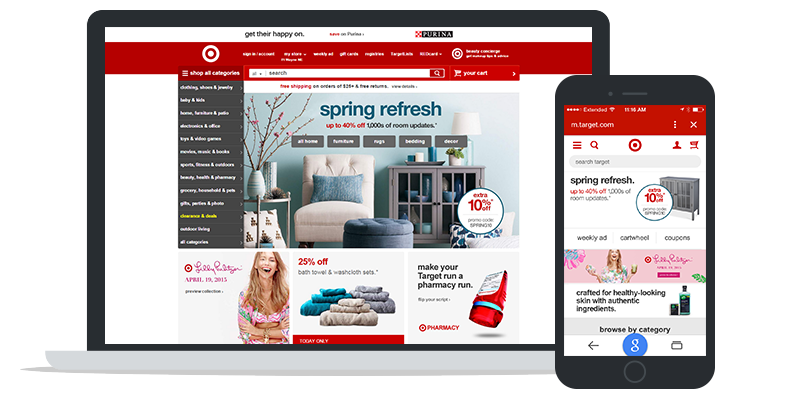 The mobile version of Target's website reorganizes the navigation for users. Responsive design removes the frustration and inconvenience for the mobile user because it simplifies the infrastructure of the website and provides the user with the most important information. 1. Flash usage: Most mobile browsers do not render Flash-based content. Therefore, mobile visitors will not be able to use a page that relies on Flash in order to display content, animations, or navigation. 2. Viewport not configured: Because visitors to your site use a variety of devices with varying screen sizes—from large desktop monitors, to tablets and small smartphones—your pages should specify a viewport using the meta viewport tag. 3. Fixed-width viewport: This report shows those pages with a viewport set to a fixed width. Some web developers define the viewport to a fixed pixel size in order to adjust a non-responsive page to suit common mobile screen sizes. 4. Content not sized to viewport: This report indicates pages where horizontal scrolling is necessary to see words and images on the page. 5. Small font size: This report identifies pages where the font size for the page is too small to be legible and would require mobile visitors to “pinch to zoom” in order to read. 6. Touch elements too close: This report shows the URLs for sites where touch elements, such as buttons and navigational links, are so close to each other that a mobile user cannot easily tap a desired element with their finger without also tapping a neighboring element. Google has provided a tool to check your website to see if it’s mobile-friendly and how you can improve it. The mobile-friendly analyzer is simple to use. I recommend you check it out. This algorithm update is revolutionary, but it doesn’t mean you have to hit the panic button and scramble to build a new website. Existing websites can be modified to be mobile-friendly. It is very helpful if you are using a content management system such as Wordpress or Joomla, because the modifications can be made without having to modify the content. The addition of responsive design needs has increased overall website cost by approximately 20 percent. Website prices can differ greatly depending on where you take your business, but we recommend that you include responsive design as part of your package. It’s a necessary investment for your business. When shopping around website design services, make sure you see a portfolio of a designer’s work, not only to get some design ideas, but to test the functionality of their websites for yourself on desktop and mobile. It’s too early to tell the positive impact of this update for mobile-friendly websites, but we’re assuming that it will be significant on mobile searches. 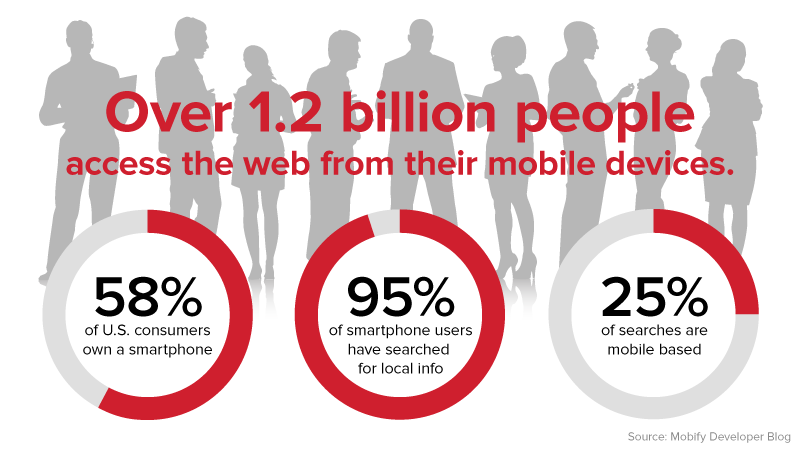 With an increasing amount of mobile searches, is your business prepared to take advantage?